Recfishwest welcomes today’s announcement from Fisheries Minister Dave Kelly, to establish a buyback scheme for commercial fishing licences in the Peel-Harvey Estuary. This announcement honours an important election commitment the McGowan government made to recreational fishers. 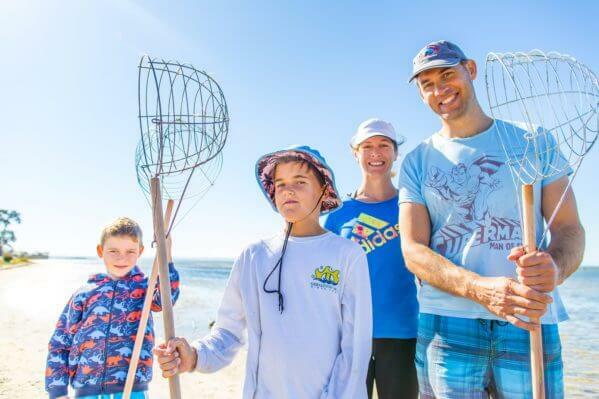 The Peel Harvey Estuary is the spiritual home of recreational crabbing with thousands of family’s flocking to Mandurah every year to enjoy the experience of catching their own seafood across the summer months. Recfishwest Operations Manager Leyland Campbell commended the Minister and his actions. “The scheme is designed to allocate more Blue Swimmer Crabs and Yellowfin Whiting to recreational fishing families and is a positive first step in bringing big crabs back to the region.” Mr Campbell said. Recfishwest are happy with the creation of a mechanism allowing recreational fishing licence money to assist with resolving resource reallocation issues. This sets an important and positive precedence for restoring the right balance between commercial and recreational fishing. Recfishwest looks forward to continuing to work with the Minster and the Department of Primary Industries and Regional Development to ensure greater recreational fishing experiences in the region. Read Fisheries Minister Dave Kelly’s Media Statement here.